Memorial Bahçelievler Hospital, one of the most comprehensive health complexes in the world, brings a whole new understanding to the healthcare sector. Memorial Bahçelievler has, via the principle of humanity and respect for nature, realized mission of providing ethical and quality healthcare services at global standards, the hospitality approach that carries the future to the contemporary time and was designed as one of the finest examples of contemporary architecture. 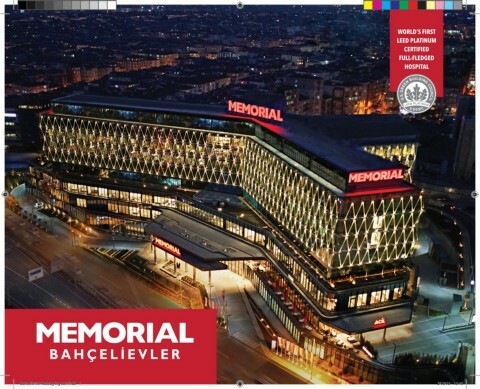 Memorial Bahçelievler, the 11th hospital project of the Memorial Health Group, serves at a total of 72 thousand square meters of area. The center, which is equipped with the most advanced diagnostic and treatment units, has a bed capacity of 340 and has a total of 15 operating rooms and a 49 intensive care bed capacity, 135 outpatient clinics and 31 medical observation rooms. In the design of the Memorial Bahçelievler Hospital, every detail was considered for the comfort of patients, their relatives as well as the employees. Starting from the fact that healing starts with the first step taken in the hospital; from the lobby area to the outpatient clinics, from patient waiting areas to physicians and patient rooms, everything was designed in such a way that it meets all the needs of the patients. Patients as well as their relatives have been provided the opportunity to comfortably pass their time as if they were in their living room, especially in the lounge areas located on the floor. From the choice of color, to the forms of the items, to the accessories selected without lighting, everything was planned to be a part of the healing process. Specialized diagnostic and treatment programs are offered with imaging units with superior technological features, complex laboratories, superior technology operating rooms and intensive care stations, hybrid operating rooms, robotic applications and specialized centers. Memorial Bahçelievler Hospital's technological infrastructure; has been equipped with one of the most advanced systems in cancer treatment, the new generation beam therapy Elekta Versa HD SIGNATURE, robotic surgery, radiological imaging systems (MR, CT, PET-CT, gamma camera, x-ray, mammography, fluoroscopy, ultrasound, echocardiography and angiography) operating rooms and bright intensive care units designed with a functional structure providing mobility for non-mobilized and unconscious patients that are Turkey's first units that are using the "Patient Lift" technology. Bahçelievler Hospital, where the Memorial Health Group has transferred all of its experience in the field of hospitality, is equipped with superior technological equipment and is serving with its academic staff, experienced specialist physicians who have achieved significant experience and success in national and international platforms that are specializing in specialized fields, nurse staff, patient care staff and all health care workers who will be contributing to the physical and psychological healing process of the patient with the help of experienced and conscious care. Memorial Bahçelievler Hospital won the "LEED Platinum", the most prestigious high green building certificate awarded to leading institutions in terms of energy and environment friendly design. This certificate, which is the highest rated one among those executed by the USGBC (United States Green Building Council), has been received among fully equipped hospitals around the globe as well as Turkey for the first time by the Memorial Bahçelievler Hospital. The interior and exterior spaces of the Memorial Bahçelievler Hospital, that has been built with an environmentally conscious approach, were designed by taking into consideration the positive effects of green spaces on human health and psychology. Living plants that will reflect all seasons, life cycles and biorhythms within the hospital, will make the patients and their relatives as well as the employees feel themselves present within the nature. The landscape arrangement, in which non-allergic natural plants have been preferred, also adds an aesthetic appeal to the architecture of the city. The Memorial Bahçelievler Hospital was built under consideration of environmental sensitivity, within a spectrum extending from energy efficiency to waste management and from sustainable area planning to indoor quality criteria. Memorial Bahçelievler Hospital draws attention with its "timeless designs" in which daylight is used to its maximum extend for the positive effects of green and the artistic healing power reflected in architecture on patients and their relatives' psychology. "Art" is one of the main themes of the Memorial Bahçelievler hospital that has been created by famous consultants on acoustics, landscape, lighting and design under the leadership of Memorial's experienced project team. Memorial Bahçelievler, the 11th hospital of the Memorial Health Group, which accepts patients from 92 countries in the world, is also of great importance for foreign patients thanks to its specialized departments that are consisting a reference center in the international arena.